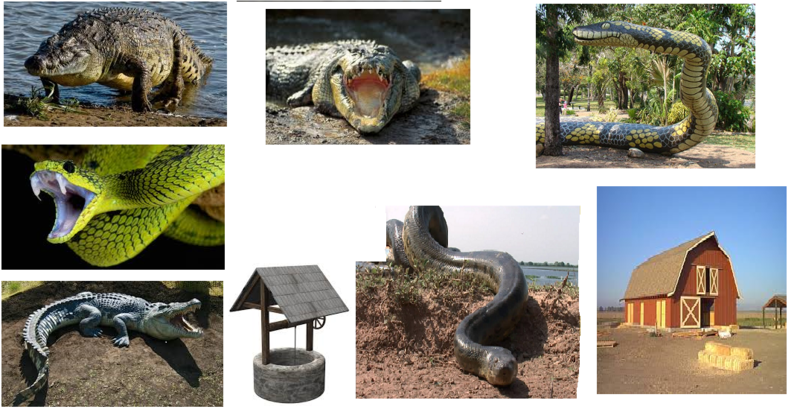 waking up several times in this dream, me and a group finding a country ranch to hide out in, not knowing on arrival that it was boobie trapped, once at the entrance very large snakes and crocodile like creatures rise up from the earth moving fast chasing us. One of the crew member shouts out its a realistic holographic security system running around with our hearts beating trying to find the off switch, the tech guy among us realizes this is an older system and that if we wanted to use this place to rest up, we would need to be eaten up by one of then in a certain spot to enter its virtual system in order to flip the switch. Having no choice but to volunteer i have to stand by the water well and go through the extreme pain of being killed and then eaten by one of these creatures on the spot to enter and then in it run to the barn to flick the switch, but if i was dragged and carried out of this particular spot while being fully eaten, i would not appear in the virtual world to do so and also they would not be able to bring me back to life. As i hold my self steady and try to discipline my body to cry out and or move while one of the crocodile and snakes start to head my way, i think to my self how lucky i am that the croc got to me before the snake so in order to be in that place as i’m shredded and swallowed by the crocodile, this system was made so precise in the pain of a real death by each type of specific animal or creature.